AIRLINERCAFE.COM - Forums - My new workbench! Forums / 5. Public / Anything Goes / My new workbench! After a house fire in 2013 and grad school after that, I haven't fondled plastic in a long time. Finally have a place, the space, and the money to build my dream hobby room. I had an "L" shaped counter top custom built, and added a 2x4 frame under it, supported by 4x4 legs. I build it to standing height (the work surface is 42" off the floor). I've been doing all my computer work standing up for the past several years, and it's much better on my low back (and for yours too!). If I need to I can get a tall stool eventually. The left side is almost 8' long, and the right side is about 6 1/2'. The window is a slider, so I plan on building a spray booth with a set-in exhaust that I can set into the window opening when I'm using it, then close the window later. On the far left end I'm planning a photo studio setup (eventually). 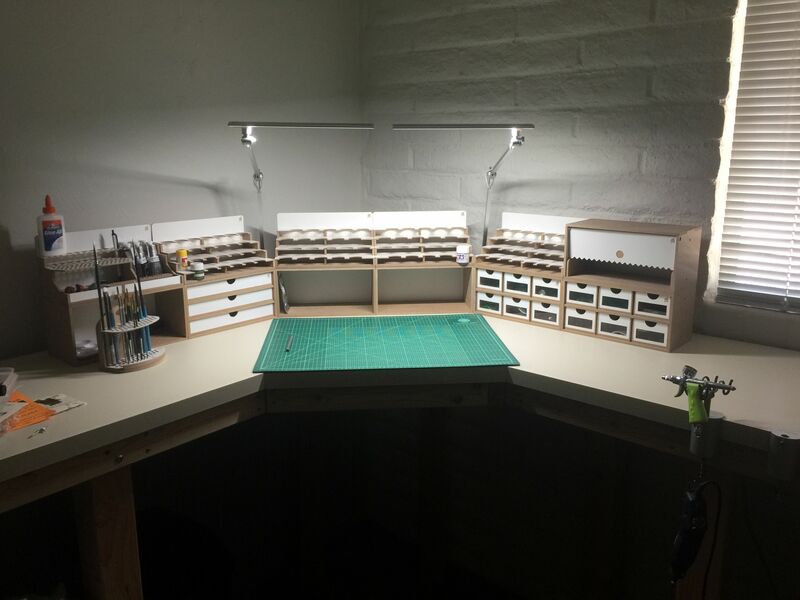 I purchased Hobbyzone USA (www.hobbyzone.biz) modular storage units and spent most of yesterday assembling them. They're very nice, and I highly recommend them. They're individual modules, held together by very strong little magnets so you can rearrange them as needed and add on more if desired. Still have a few things to do to get it all organized, but I'll soon, at long last, be back up and running! Looks great!! Congrats! Once I'm settled I want to have something similar, especially a spray booth with exhaust. Enjoy!! Very nice. Behind the central paint rack, do you plan on putting a computer monitor for reference photos and things? Jennings' setup is awesome! The counter size is just about perfect for keeping things organized. I want to do something very similar when I get a permanent hobby setup going. I had never thought of putting up a monitor, which I think I might do as well. Lots of great ideas! Excellent lay out. I hope it works well for you. At your age, 115, I do not see the magnifying glass/lamp nor the opti-visors!